When it comes to your elevator cab’s interior, style and presentation can go a long way in establishing the level of quality attached to your company name. First impressions and branding are intertwined when it comes to a company’s property, and every aspect of the building needs to be clean and tidy for the best results. If you can’t take care of your own operation, how can others expect you to do the same for them? When it comes to finding quality elevator parts, you need a trusted company with years of experience in the industry and a proven track record for delivering amazing to their clients. When it comes to upgrading commercial elevators, our team of experts is here to deliver the best solutions to match our quality products. Kohtler Elevators is proud to offer elevator parts that are well-constructed and stylish. We’re here to improve the functionality and aesthetics of your elevator cab interior, as there are many options. 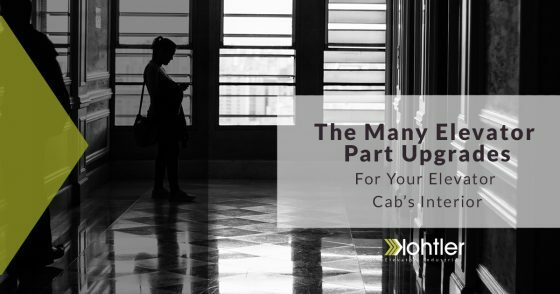 Today, we’ll briefly highlight the standard features offered in our cabs, as well as optional material choices to best meet your building’s needs. If you’re looking for the best service and parts in the industry, be sure to reach out to Kohtler Elevators today! Doors – Your elevator door will be comprised of a skinned, brushed stainless steel. Known as a No. 4 finish, this surface produces a uniform and polished look that is sure to impress. Walls – Your walls serve to enclose your passengers with comfort and quality, and our wood-core laminate finishes are the perfect answer for finding an interior that looks great with an affordable cost. Sill – As the threshold to your elevator cab, your sill needs to be built to hold up adequately to wear and tear while retaining a clean appearance to match the floors. We build our sills from aluminum. Front – The front of your commercial elevator needs to look great and hold up to the daily wear and tear of foot traffic, carts, deliveries, and more. Your elevator front will feature 16-gauge stainless steel. Handrails – A stabilizing component in any cab, your handrails will be made of a solid bar with a brushed stainless steel finish. You can expect a big return on your handrail, as this piece improves safety while modern technology focuses on anti-microbial outcomes. Lighting – Featuring incandescent downlights, these components will be integrated with the ceiling while still allowing for easy maintenance. Canopy – The enclosure for your elevator should emanate quality, and our 14-gauge stainless steel canopies are made to hold up to the task. Ceiling – The top of your elevator cab will need a cover, and our island ceilings feature a drop-in element covered in a plastic laminate finish to provide longevity with your high-voltage downlights. Kohtler Elevators is proud to provide the highest level of quality, and we often tell our customers that the phrase “upgrades” implies that one product is inferior. Here, our optional features are available to deliver the same level of excellence with different style choices. Doors – The Kohtler team can work with you to create a variety of elevator door solutions to match your building’s unique style. Your doors can be skinned with plastic laminate, a stainless steel mesh, or a range of other patterns and paint options for the best fit. Walls – Different industries have different demands, and we are here to encase your elevator cab interior with a stainless steel or brushed bronze finish. We can also construct your walls with 16, 14, or 12-gauge steel. Front – The outside of your commercial elevator can easily match the interior improvements with varying stainless steel and brushed bronze finishes. Handrails – In order to better suit your needs, we offer a wide range of styles and materials when it comes to finding the perfect handrail. Canopy – That same enclosure you invested in can be upgraded to utilize 14-gauge steel or 12-gauge painted steel. Ceiling – The top of your elevator interior can also benefit from a wide range of style options. Oftentimes, this is done to match the handrails and walls. No matter what style choice you make with each component of your lift system, it’s important to remember that Kohtler relies on the best equipment and personnel in the industry to deliver the best results each and every time. We rely on computer-controlled technology to deliver the highest level of precision and fit for all of the elevator parts your business needs. We’re all about performance, but we also rely on style to create truly amazing outcomes for our clients. Contact us today to see how we can improve your elevator cabs!